Video: PMG’s State of the Postal Service report – postalnews blog. Span of control is defined as the number of subordinates in an organization who report directly to one supervisor and is determined by evaluating several factors. Some examples of these factors include, but are not limited to nature of work, degree of risk in the work for the organization, similarity of activities performed, and qualifications, experience and geographic location of subordinates. The U.S. Postal Service has established a span of control target of one supervisor for every 25 craft employees (1:25 ratio). via USPS Office of Inspector General. The USPS Product Innovation team will present two webinars to provide mailers all they need to know to participate in three of the upcoming 2013 Promotions—Product Samples, Picture Permit and Emerging Technologies. The first two, Product Samples and Picture Permit, are designed to encourage mailers to use direct mail to help acquire new customers, improve the mailpiece’s visibility and to build brand awareness. The Emerging Technologies promotion is designed to encourage innovation and the use of technologies that can make mail more interactive and add value. Phone lines for the webinars are limited–sign up today so that you are prepared and informed. Registration via the Business Customer Gateway for the Product Samples promotion is now open. Registration opens on June 1st for Picture Permit and June 15th for Emerging Technologies. Webinar pre-registration is required and lines are limited so please sign up for these informational sessions today. How Johnny Cash Became a Forever Stamp | MTV Hive. Technical Specifications and Guides – including Mail.XML specs for Data Distribution, FAST, and eDocs, and USPS Mail.dat tech specs for releases 33, 24, and 35. PostalOne!® Release 34.1.0 Deployment — is scheduled for June 2 during the regularly scheduled maintenance window and will include several infrastructure changes. There will be a PostalOne!® outage from 4 a.m. to 9 a.m. CT on Sunday, June 2, 2013. During this outage, PostalOne! will be unavailable, including Mail.XML®, FAST® Web Services, and eDOC services. There are no new release notes and no new Mail.dat® client with this release. PostalOne! Release 34.1.0 Test Environment for Mailers (TEM) Deployment — is scheduled for Monday, June 3, 2013, and PostalOne! TEM will be unavailable from 4 a.m. through 7 a.m. CT.
Upcoming Webinars for Mailers — Mail Entry and Payment Technology (MEPT) will host webinars for mailers in the next few weeks on Folded Self-Mailers (May 28, June 4 and 6), the enhanced Business Customer Gateway (May 31), and Technology Credit (June 6). Go to RIBBS/Intelligent Mail Services/Education for dates, times and log on information. Tech Credit? No Thank You. The Association for Postal Commerce (“PostCom”), on behalf of the Association of Marketing Services Providers (“AMSP”), the Direct Marketing Association (“DMA”) and the Association of Magazine Media (“MPA”) have submitted comments to the Postal Regulatory Commission in Docket No R2013-6, Notice of Price Adjustment (Technology Credit Promotion). PostCom urged the Commission to reject the Postal Service’s proposal. Hey! You’ve not been getting the weekly PostCom Bulletin–the best postal newsletter anywhere…bar none? Send us by email your name, company, company title, postal and email address. Get a chance to see what you’ve been missing! 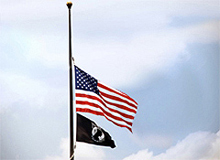 Monday is Memorial Day, one of the 6 days each year postal facilities are required to fly the POW-MIA flag. Also, facilities that are open on Memorial Day must fly the U.S. flag at half-staff. In FY 2012 and 2013, the U.S. Postal Service® invested $225 million to grow Mail Transport Equipment (MTE) inventories. To protect this investment, the USPS® has developed the Clean Sweep program to monitor MTE within the network. Beginning May 2013, each delivery and retail unit will be asked to perform a “clean sweep” of their facility and return any excess or improperly used MTE to circulation. What is Considered Improper Use of MTE? Storing or transporting items such as retail records, files, postal supplies, cleaning supplies, decorations, and tools, or using MTE as recycling bins, are some of the more common ways these valuable containers are misused. Use the service talk and the records retention table to remind employees that MTE should only be used as intended — as custom-made, automation-compatible containers. n Count all MTE in unit, even if in use, and record these items on weekly inventory reports. n Leave MTE Awareness posters and Stacking Standards posters displayed. n Employees should receive service talks to promote awareness. n Areas should be designated for needed MTE. n Neat and organized excess MTE can be palletized for return to the plant. n Supplies for the lobby or maintenance should not be stored in MTE containers. n Window clerks and carriers should rubber band hold mail for customers. n Enter a count of all MTE used for retail and BMEU records storage in weekly inventory reports. n Examine and determine the quantity of records stored in MTE. n Purchase alternative containers for records currently stored in MTE tubs and trays. On February 20, 2013, an online MTE reporting system was launched nationally for Level 20 and above delivery and retail units. These facilities are now required to submit weekly inventory reports for both empty and full MTE. The report is accessed at the CSDC homepage under “Our Other Sites”. Though other levels/offices are not required to submit weekly reports, they are encouraged to participate in the Clean Sweep program through appropriate circulation and use of MTE. What are the Advantages of Proper MTE Usage and Circulation? > Improves the overall financial state of the USPS. >Improves efficiency at the plants to better serve customers. > Ensures mailers have the necessary equipment to generate revenue. > Provides a clean, safe office environment. > Provides additional work room space, once excess MTE is removed. > Provides additional storage after proper disposal of any outdated records stored in MTE. Over the next few months, we will recognize offices who return the most MTE to circulation, in proportion to their size. Results will be based on MTE reporting from May 6 – 26, 2013. All districts must submit their return reports to Headquarters by June 6 to be eligible for recognition. Before and after photos will be shown in subsequent issues of the Postal Bulletin. via USPS Issues “Clean Sweep” of MTE in Delivery Units.